As you probably know, Blogger allows you to use a Word Verification system for people to leave comments on your blog posts. And as you also probably know, it can be extremely difficult to decipher those numbers and letters. This can discourage people from leaving comments and since part of the fun of blogging is sharing our thoughts with our fellow crafters, we don't want to discourage anyone. 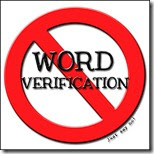 To make it fun for everyone, we encourage you to turn off Word Verification. Since the purpose of it is to block spam comments there are a couple of simple alternatives you can use. From your blog's Dashboard choose Settings. From the Settings menu, choose Posts and Comments (see below). This will bring you to a new page where you can make changes to who can comment and how you receive those comments. Within the circle on this picture above are the important options. To turn off the pesky Word Verification, just click the dropdown arrow next to "Show word verification" and change it to No. Turning off Word Verification is going to subject your blog posts to spam comments which usually come from anonymous commenters. If you don't want to get comments from "Anonymous" change the "Who can comment" setting to Registered User. This will allow comments only from people who use Blogger, WordPress, Typepad, LiveJournal and AIM. (And if I can insert an editorial comment here, since I turned off anonymous commenting I haven't received one single spam comment so I can attest that it works like a dream)! You can also decide to use Comment Moderation. This will involve some intervention from you because each time someone leaves you a comment you will get an email that you will need to approve for publishing or delete as spam. (You can see in the picture that I've got Comment Moderation off and that's just because I don't want the extra work! LOL)! It's important to note that Comment Moderation by itself won't eliminate spam, but it will allow you to delete it before it shows up on your blog. So we here at Freshly Made Sketches hope that you will turn off Word Verification and use an alternate method to weed out the spam. You can be sure that your blog visitors will appreciate it. If you have any questions, leave a comment and we'll try and help.